The phenomenon of the Sun's apparent magnification or shrinking throughout the day is a common cause of confusion among round earthers trying to understand the Flat Earth Theory. This article serves as an introduction to the subject. Q: If the sun is disappearing to perspective, shouldn't it get smaller as it recedes? A: The sun remains the same size as it recedes into the distance due to a known magnification effect caused by the intense rays of light passing through the strata of the atmolayer. "IT is well known that when a light of any kind shines through a dense medium it appears larger, or magnified, at a given distance than when it is seen through a lighter medium. This is more remarkable when the medium holds aqueous particles or vapour in solution, as in a damp or foggy atmosphere. Anyone may be satisfied of this by standing within a few yards of an ordinary street lamp, and noticing the size of the flame; on going away to many times the distance, the light upon the atmosphere will appear considerably larger. This phenomenon may be noticed, to a greater or less degree, at all times; but when the air is moist and vapoury it is more intense. It is evident that at sunrise, and at sunset, the sun's light must shine through a greater length of atmospheric air than at mid-day; besides which, the air near the earth is both more dense, and holds more watery particles in solution, than the higher strata through which the sun shines at noonday; and hence the light must be dilated or magnified, as well as modified in colour." The next time you observe the sunset notice how the sun is much hazier, diluted, and less intense than when it is overhead at noonday. This is a tell-tale sign that its rays are passing through a thick horizontal atmolayer, much like the light rays from a distant street lamp. The sun's intensity is so diluted when it is low in the sky that it is possible to look directly at it without squinting. If you've ever seen a city at night you would know that distant light sources appear magnified from afar because they are shining though an atmoplanar medium. The farther you move away from the source, the more medium you put between you, the more magnified the lights appears. As you move towards the source the magnified lights shrink in appearance. As you move away the lights grows in diameter again. An average bustling city at night. Consider the picture to the right. 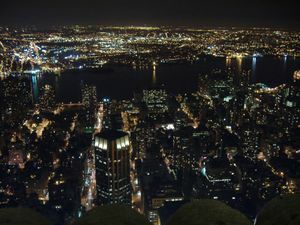 You will immediately notice upon looking at the image that the distant lights in the scene appear magnified and intense, particularly the bright white ones in the upper left of the image. You should note that many of the lights in the background are about as big as the lights in the foreground. This is entirely contradictory to what one would expect. The background lights are much farther away and the distant bulbs are all smaller than a single pixel of the screen. The lights maintaining their size in the background is a great example of the magnification effect of the atmolayer balancing out the natural shrinking to perspective. As an analogy for the enlarging of the sun at sunset, lets imagine that we are in a dark room with a flashlight. We shine the light upon the wall, creating a distinct circle of light. If we walk backwards and recede away from the wall the spot of light grows in diameter. When we walk towards the wall the spot of light becomes smaller again. The same effect happens with the distant sun at sunset. Instead of a solid surface like a wall, however, the rays of light are shining upon the semi-transparent fog of the atmolayer between the observer and the sun. The natural shrinking of the sun due to perspective is counteracted by the enlarging effect of its light upon the horizontal strata of the atmolayer between you and the light source. This is how the sun's diameter is maintained throughout the day. 1. The effect only affects illuminating sources of light above a certain intensity. It does not happen with all lights or light sources. 2. The effect only affects illuminating bodies in the far field. It does not occur when the light source is too close to the observer or camera. Light sources in the far field will appear to be the same size in the distance. Bright lights in the distance will often project upon the atmoplane. The light from these incoming headlights are a constant size down the highway as far as the eye could see. 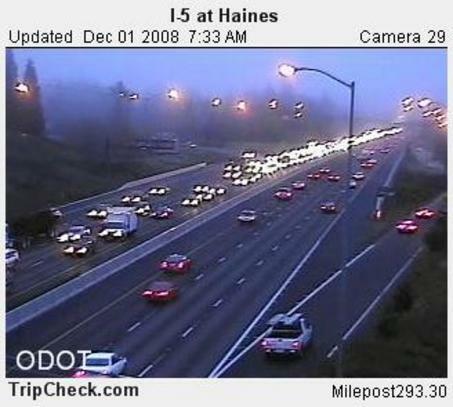 Notice how it is only the intense headlights of the cars on the incoming lane which are magnified. The headlights on the lane coming towards us are all the same size. The intense light from the headlights have caught onto the atmoplane between the source and camera to create a magnification of the light. This magnification increases with distance, allowing the headlights to appear the same size down the entirety of the lane. In contradiction, the red tail lights of the cars driving away from the camera are not intense enough to catch onto the atmoplane and are appropriately shrinking into the distance. One should notice in the above video that the incoming headlights in the distance are not little specks of light, as would be expected in such a scene, but large spots of light that overlap each other. Note: The lamps closest to the observer in the above image are slightly larger than the lamps in the distance, this is true. Lights very near to you are going to look bigger if the body if it is too close to the observer and there is not enough atmolayer to catch upon and the body is bigger than the projected image. A streetlight which is located at a distance of three inches from your eyeball will, of course, look bigger than a streetlight in the distance. Very close lights being bigger is not a contradiction. In these discussions we are primarily concerned with very distant lights in the far field. We can see that the distant lamps in that scene are not consistently shrinking, despite being as spaced out from each other as the nearest lights are. The shrinking seems to slow significantly as the distance increases, opposite of what one would expect. The most distant lights should be small specks, but instead appear relatively consistent in size with the other streetlights in the far field. This is evidence of a magnification effect. In the case of the sun, the sun already starts off distant from you in the far field when it is overhead and then gets even more distant when it is traveling away from you. It is never in the near field like a streetlight might be. It is often asserted that the above effects are caused by glare, and that if one were to view the scene through a polarized lens the glare would be reversed. 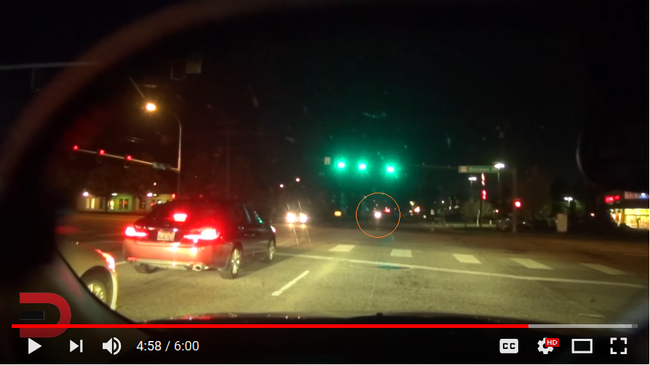 Take a look at this video and demo of a popular pair of polarized glasses for night driving at the 4:52 mark. Continue watching the video to verify that the object in question is indeed a car. On the left hand approaching lane there is a car in the distance with headlights which overlap each other. The headlight of the approaching car are magnified and overlap, both when seen through the polarized lens and without the lens. A relative constant sizing effect can be seen in the simple reflections of mirrors. This may be analogous to a projection on a medium between the observer and the source body. “ Q. This was an experiment I saw in my son's workbook. It said to mark out the top of your forehead and the bottom of your chin on a mirror using a whiteboard marker. Then slowly move backwards, and investigate what happens to the size of the reflection subjective to the two marks made. It actually got me quite flabbergasted. I always thought the reflection would get smaller as you moved away from the mirror. Applying the mirror example to the projection explanation, the "mirror" (projecting surface) of the atmolayer maintains a fixed distance away from the observer on the atmoplane, and thus does not get proportionately smaller. The radiating light source creates a projection in front of the observer and can recede in distance away from the observer with its new apparent dimensions being same as its original projection upon the atmoplane. As it shrinks to perspective, its projection also enlarges by the same ratio, just as with the mirror reflection experiment, causing it to stay the same relative size on the medium as it recedes. It should be noted that not all light sources can create a projection upon the atmoplane. The reader is encouraged to perform the mirror experiment for his or her own self. This phenomenon of enlarging rays in the far field is also seen in lasers. Supposedly "straight" rays of light will spread out when shining over long distances. Note that the effect doesn't affect the near field so much as the far field. "The beam divergence of an electromagnetic beam is an angular measure of the increase in beam diameter or radius with distance from the optical aperture or antenna aperture from which the electromagnetic beam emerges." Additionally, it should be noted that the sun appears to be inconsistently bright. This is curious, since in the Round Earth model the sun is an object where every point from half of the spherical sun's surface is reaching the eye of the observer. One should expect to see all parts of the sun's body with equal intensity, or with increased intensity at the edges, as intensity is defined by accumulated photons, and the number of miles per square arcsecond increases in those regions. The hotspot seen in the sun may suggest a projection upon the atmoplane. 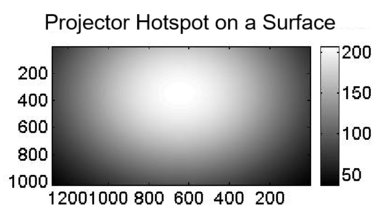 Projections, such as from a projector shining on a movie screen, tend to have hotspots in them. The inconsistent brightness is a problem in RET, and it is well admitted. Astronomers find difficulty in explaining how it works to have outer layers of the sun significantly dimmer than other layers. Astronomers had to make the outer visible layer of the sun, the photosphere, very cold—at only about 6000 degrees Kelvin, compared to the much hotter atmosphere of the sun called the Solar Corona (Archive) that is about several million degrees Kelvin, which is seen as a wispy aura around the sun seen at Total Solar Eclipse or with a coronagraph; and also significantly different compared to 15 million degrees Kelvin for the Solar Core (Archive). In addition, astronomers had to make the outer cool photosphere layer transparent or semi-transparent so that the radiation from the core could pass through it to the observer. The Sun's surface, the photosphere, has a temperature of around 6000 degrees, but the outer atmosphere, the corona -- best seen from Earth during total solar eclipses -- is several hundred times hotter. How the corona is heated to millions of degrees is one of the most significant unsolved problems in astrophysics. "Why the Sun's corona is so hot is a long-standing puzzle. It's as if a flame were coming out of an ice cube. It doesn't make any sense!" 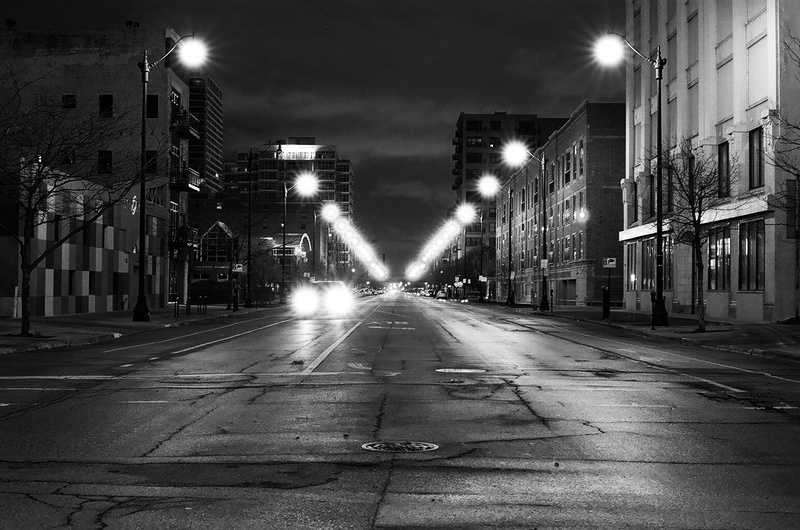 For a similar constant sizing effect look at Photographer George Shippin's Shutterstock Portfolio (Archive), which features numerous city night photographs showcasing an effect in which all of the lights in the background are the same size into the distance. The lights do not shrink as they recede. While this particular effect is not an atmospheric effect, and is instead one which manifests due to camera focusing and aperture, it is interesting because it shows that it is certainly possible for an optics effect to cause lights to maintain their exact size, no matter their distance from the observer. The effect is known as Circles of Confusion (Archive). The light physics of this 'constant size' effect may provide insight on the light physics of the 'constant size' effect that is happening within the atmoplane. Q: Has the projection of light on the atmoplayer been experimentally verified? A: Light beams have been verified to project on the atmolayer. See the Projection of Lasers section. Q: Shouldn't the sun get blurrier if it is being magnified? A: The sun actually does get a bit fuzzier when it is at the horizon compared to overhead at noonday. Q: But shouldn't the sun get 4x blurrier if it is increasing its diameter by 4x, for example? A: No. You are assuming that the sun is being magnified in a similar method as a magnifying glass, where blurriness occurs as a ratio with distance. This is incorrect. The magnification of the sun occurs through a projection. A projection of light is occurring upon the atmolayer between the sun and observer. Q: Shouldn't polarized sun glasses or a welding mask be able to restore the sun to its actual state? A: The explanation is describing a projection upon the atmoplayer. The projection is appearing upon a medium between the source and the observer. Polarized sun glasses or welding masks are useful for reducing internal glare lens effects within the eye, but would only darken the scene in this external situation. See the Polarized Lens Example. Q: Shouldn't a Solar Filter restore the sun to its actual state? A: The principle behind a Solar Filter is the same as the principle behind a pair of sunglasses. It dims the scene for eye safety. The effect is a projection of light upon the atmolayer. Would wearing a pair of sunglasses eliminate the reflection of the sun off of the side of a car? Would a pair of sunglasses eliminate or shrink the projection on a movie screen inside of a movie theater? Q: Why is the edge of the sun defined? A: So too are the edges defined on the projection from a projector upon a screen surface. A2: Despite the seemingly clean line in the solar filtered image of the sun above, in the book Gravitation Vs. Relativity by Prof. Charles Lane Poor, the author describes on p.96 that the edges of the sun are actually not defined. The clean line in the image may be a result of the contrast and brightness adjustment of the solar filter that cuts out the less intense gradient fade.